Prior to joining Diamonds, Paul had played professional and non-league football for over 20 years, making over 600 league appearances for eight different clubs. The highly experienced goalkeeper had begun his career as a youth keeper with Coventry City, and was a member of the side which lifted the FA Youth Cup in 1987. His first professional contract was signed in the summer of 1988, when he joined Cambridge United as a back up. He went on loan to Bath City in October 1988 to gain some first team experience, before making some 12 appearances for the U’s. He spent a short time with Malaysian side Sabah FA, before returning to the UK, joining Fisher Athletic in 1989. In the summer of 1990, he joined Kettering Town, where he spent two seasons before moving on to Boston United. He is widely considered as the best Boston United player of all time, as voted by the fans in a recent poll and holds the all-time record for the most ever appearances for Boston United – 625 games in all competitions. His record breaking 573rd game for the Pilgrims came in a Lincolnshire Senior Cup game against Scunthorpe United in August 2003. He also played several times for the England National Game XI. He spent 12 seasons at Boston United, and missed just one game in their Conference Championship side during the 2001/2001 season. An injury midway through the 2003/2004 season saw his time at Boston come to an end as he was unable to regain his place from replacement Nathan Abbey. He left in October 2004, and joined Scarborough, but the travelling proved to much and he joined Dagenham & Redbridge on a non-contract basis the same month as cover for the suspended Tony Roberts. In November 2004, he joined St.Albans City and made 84 consecutive appearances, before a suspension ended the run. He was part of the promotion winning side that saw the Saints reach the top tier of the Football Conference in the 2005/2006 season – when he won the St Albans Player of the Year award. He was also a goalkeeping coach at Boston United during his latter period at St.Albans. 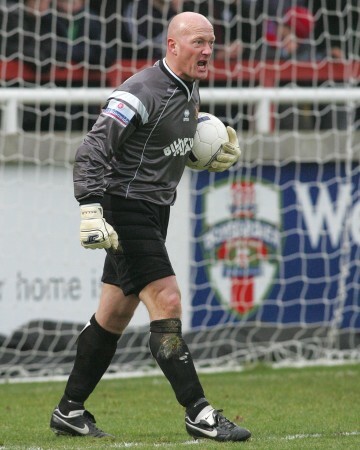 On 17 May 2007, Garry Hill brought the keeper to Nene Park as Diamonds prepared for their second season back in the Conference. After 13 consecutive appearances for Diamonds, he lost his place to Paul Nicholls, before returning to the first team. The arrival of loanee Dale Roberts in January 2008 however signalled the end of his time at Nene Park, and he left after making just 25 appearances. He rejoined St.Albans City on 28 February 2008 after being released by mutual consent, and remained their first choice keeper at the start of the 2010/2011 season. On 23 March 2011, he was released by mutual consent and rejoined Conference North side Boston United – the side where he had previously made 625 appearances. He went on to make 679 appearances for the Pilgrims before being released at the end of the 2011/2012 season. On 1 June 2012, Paul signed for NPL Premier side Worksop Town- at the age of 42. Despite talk of his retirement, Paul rejoined Southern Premier side St.Albans City on 16 May 2013. After a further season with the club, Paul was released on 1 June 2014, 2 days after his 44th birthday. On 23 July 2014, he joined Southern League Division One Central side Royston Town. He played for St Neots Town in the latter part of the 2014-15 season, Dunstable Town in 2015-16, and Stamford the following season, finishing his career at Wisbech Town in 2017-18. He finally retired at the end of the 2017-18 season having played 1277 league and cup games – a world record. His Wikipedia page is here.